I have been taking pictures forever, my mom instilled in me a love for capturing memories. I learned how to shoot a DSLR in manual mode in 2012 and have loved learning and growing since then. I stay at home with my 2-year-old boy and baby girl and am grateful for the creative outlet and small income that photography has given me. I became even more passionate about my business when I was able to use it to raise money for the Sprankle Adoption in 2014. I have a small in-home studio with a white backdrop where I offer some sessions but I do most sessions "on location" meaning either at the clients home or an agreed upon location. I commonly use Wellfield Botanic Garden, Bonneyville Mill County Park, Shanklin Park, the Old Bag Factory, downtown Goshen and downtown Elkhart. $150 for one child, $25 per each additional child. Can be done in studio or on location. $250, includes individual child photos, mom and dad, the whole family, etc... My goal for family sessions is to start the session with candids of the family having fun together (let's be creative, what does your family enjoy doing together?!) and get some more traditional posed photos along the way. On location only. $250, includes individual photos with the mama-to-be and photos with hubby and other children. Can include both studio and on location. $300, lifestyle shoot at the hospital, birth center, or in the home, includes family shots. No studio. Capture your little one's first year with four discounted sessions, total investment is $600. $250 due at first session and $100 at the remaining three sessions. Includes a newborn lifestyle session (including family photos), 4-month session, 8-month session, and 1-year session. Newborn lifestyle session takes place at hospital, birth center or home. 4, 8 and 12-month sessions can be in studio or on location. Can add a mini maternity session to the package for $100. 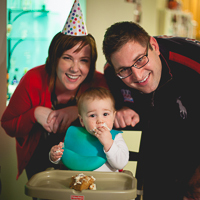 Cake smash/bubble bath at 1-year session is an additional $50. $300, includes two outfits and two locations. $400, includes two sessions and multiple outfits. We work together to capture what is unique about your life and interests and get some more traditional photos along the way. 25+ edited images included via digital download for all regular sessions. TRAVEL (outside of a 30 mile radius of 46540) is $1.25 per mile round trip. I may offer mini-sessions periodically throughout the year, these sessions are 20 minutes and scheduled back-to-back. Price TBD, one family unit only. 5-10 edited images included in digital download for mini-sessions. • Regular sessions typically last 30-60 minutes, that is up to the photographer's discretion and the child or family's patience! • I do not have an additional fee for the rights to your photos and you do not have to order prints through me. • You are allowed to post photographs from your session online and have prints, photo books, canvases, etc... made, but you are not allowed to alter the photographs in any way. • Your digital download will be sent to you via Zenfolio. The link will be good for three months, you need to download the high-res files within that time. • Payment is accepted via cash, check or Paypal (Paypal address is tinaherschberger@gmail.com). Paypal accepts all major credit cards. • A $50 deposit for your session is due within 7 days after booking to reserve your spot.